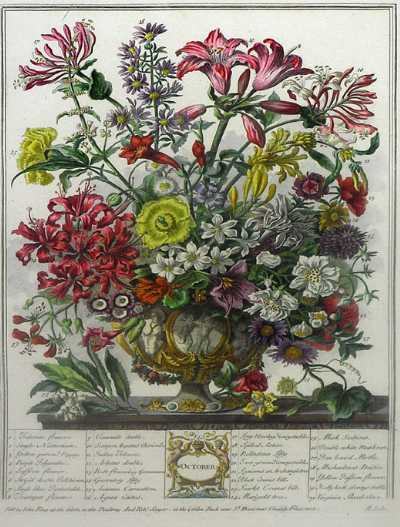 A very attractive copy of Robert Furber's classic, Twelve Months of Flowers (1730), comes to auction at Bonham's-New York Fine Books and Manuscripts sale, October 10, 2011. It is estimated to sell for $30,000-$50,000. It's a glorified seed catalogue, and glorious it is. 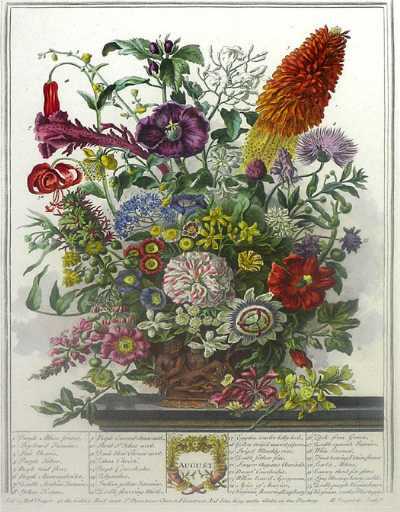 Furber's intent was "to make the Love of Gardening more general, and the understanding of it more easy, I have from time to time published Catalogues, containing large Variety of Trees, Plants, Fruits, and Flowers, both Foreign and Domestic, cultivated by me for Sale" (Short Introduction to Gardening). 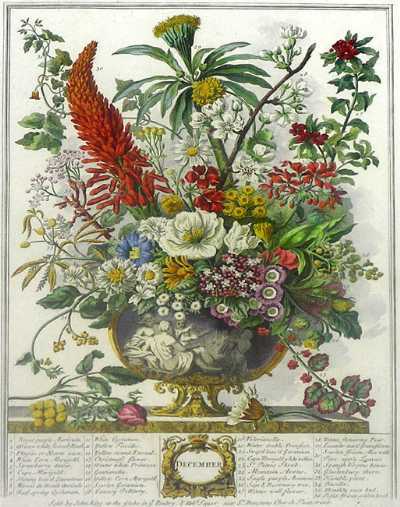 The flowers were grouped into bouquets according to the month they bloomed, and referenced with numbers and captions so that Furber's customers could order particular specimens. In this regard, the publication follows in the tradition of Emanuel Sweert's Florilegium (1612-1614), a similarly elaborate sale catalogue. Furber spared no expense, commissioning the celebrated Antwerp-born painter Pieter Casteels and the skilled engraver Henry Fletcher. The illustrations transcended their original commercial purpose and were reprinted throughout the 18th century to capitalize on their decorative appeal. 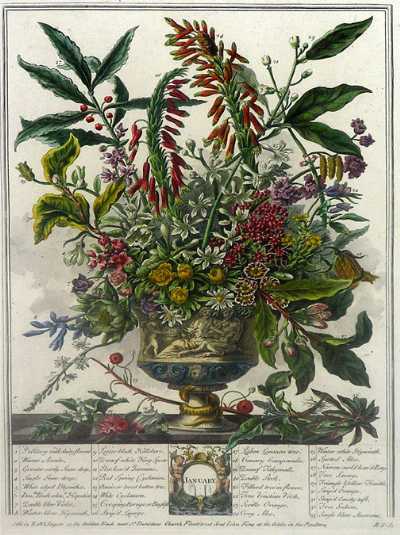 "In the years 1730 and 1732, there appeared two extremely important series of plates, both published by Robert Furber, a nurseryman in Kensington, then outside of London. One series is entitled, Twelve Months of Flowers and the other, Twelve Months of Fruit. These are sales catalogues in the grand manner, consisting of arrangements of flowers or fruits according to the months in which they bloom or ripen. Each flower or fruit bears a small number and its name is to be found by referring to a the key at the bottom of the plate. From these prints patrons actually ordered their new plant material. 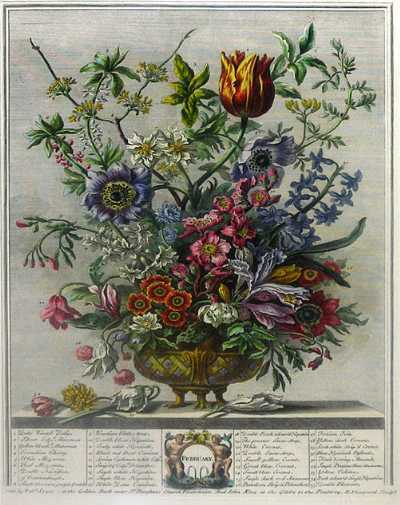 "That the decorative quality of Twelve Months of Flowers was fully appreciated, it is proved by the fact that six different publishers in the 1740s and 1750s offered copies of the plates which could no longer have served the purpose of a nurseryman's catalogue. These were re-engraved in reverse on a slightly smaller scale with the addition of butterflies, caterpillars and other insects which in many cases over-crowded the composition" (Dunthorne, Gordon. 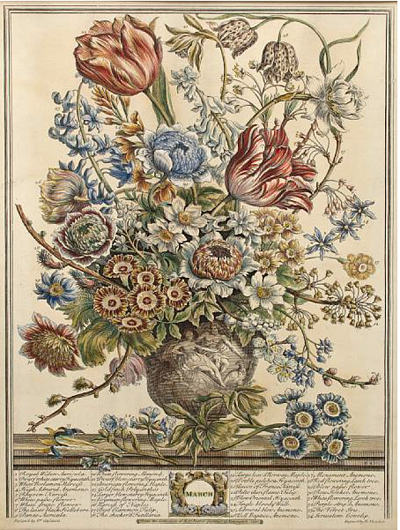 Flower & Fruit Prints of the 18th and 19th Centuries, pp. 12-15). The last three copies complete with the subscriber's list to fall under the hammer fetched $30,000 (Pacific, April 1, 2010, lot 398, two plates torn); $47,500 (the Michale Kuse copy, Sotheby's New York, June 20, 2003, lot 12); and $100,100 (Christie's, Nov 28, 2001, lot 27). FURBER, Robert (c.1674-1756). Twelve Months of Flowers. Kensington: Robert Furber, 1730. First edition. Broadsheets (sheets mostly 430 x 330 mm). 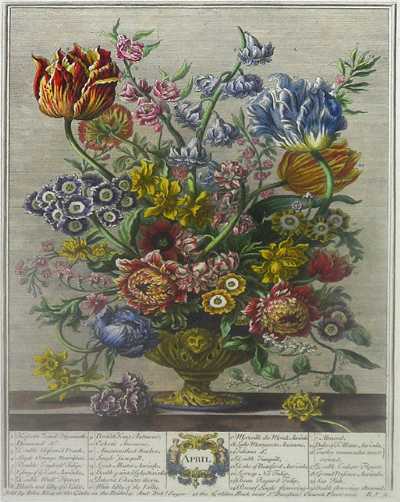 Engraved leaf of subscribers (585 x 460 mm) including title and dedication all within pictorial border of tulips, irises, carnations and other blooms, Twelve finely hand-colored engraved plates by Henry Fletcher after Pieter Casteels (1684-1740) All but November laid down. Dunthorne 115. BMNH II, 632. Henrey 734. Nissen 675. Images courtesy of Bonham's, with our thanks. The Wikipedia entry for Pieter Casteels claims that a copy of Twelve Months of Flowers sold at Christie's on May 25, 2005 for $1,640,000. Neither Christie's nor ABPC have a record of that sale or price at any date. Hello. I have three of these, but they are from the John Bowles reprint collection. I have February, March and April. Would you have any idea what their value is. Excellent condition, professionally framed. Thank you. Hello, I have 2 pictures of February and April from the collection of Robert, Furber. Gardiner at Kensington twelve months of Flowers 21.5cm by 15.8cm with custom made frames and brown paper backing. I can't quite read the writing on the bottom. On eBay the pictures are different. Different flowers, leaves & colours are either added for heightened affect or missing. I am wanting to find out how many versions of the same picture are made?. Look closely at Christie's note: It's not the book but, rather, the original paintings, without the accompanying text, that the engravings were based upon "In 18th-century English carved giltwood frames sold with a set of twelve engravings with later hand-coloring, all on laid paper. This is why ABPC does not record this sale - it's not the book. Get a magnifying glass. If, looking very close up, you see dots you have a modern reproduction. Originals will have plates marks surrounding the image whee the plate was pressed onto the paper. Then you probably have an original engraving. I may be interested in selling. No hurry. Any suggestions? Without physically examining them I can't determine whether you have original prints, restrikes from the original plates, or later reproductions. One way to rule out a reproduction is to close-up examine with a magnifying glass. If you see dots, it's a repro. What is a plates mark??? I received one from my grandmother's passing and I don't know what to look for. I just found "JUNE" printed for JOHN BOWLES at MERCER HALL CHEAPTIDE... it is professionally framed with sealed back. There are no dots visible. How do I find the value? I can forward photos. Thank you for your time and attention to my request. I've come across some that are seasons of flowers, not months. I have winter and autumn. I am looking for where they originally appeared, if not with the 12 months.